Scientists from the COMPASS collaboration at CERN have observed a new exotic combination of light quarks. The discovery was made in an experiment that shoots pions at close to the speed of light towards a liquid hydrogen target. Now, the ball is in the theoretical scientists’ court to find an explanation for the new particle status. Some explanations have been proposed, but it has been impossible so far to correctly describe all characteristics of this exotic new feature. Scientists from the Physik-Department of Technische Universität München and the Excellence Cluster Universe had a leading role in the data analysis of the new finding. The standard model of particle physics defines quarks as the fundamental components of atomic nuclei. A proton consists of one “up” and two “down” quarks, a neutron of one “down” and two “up” quarks. With this, the quark particle garden is far from being complete: apart from the two lightest quarks, there are four heavier ones: “strange”, “charm”, “bottom”, and “top” quarks, plus the corresponding antiparticles, the antiquarks. All these quarks existed shortly after the Big Bang and played an important role in the early universe. Nowadays, heavy quarks cannot be observed in nature anymore and can only be created in particle physics experiments. Quarks are “glued” together via special adhesive particles, gluons, which mediate the “strong nuclear force”, the strongest of the four fundamental forces of nature. The strong force is described by a theory called Quantum Chromodynamics (QCD), which had been developed in the late 1980s. Quantum Chromodynamics explains the basic principles on which formation of all matter is based, and prescribes which particle configurations occur in nature. In that way. QCD predicts a whole set of possible quark combinations. Some of them are well known: combinations of three quarks (baryons), such as protons and neutrons, and combinations of one quark and one antiquark (mesons), such as pions. According to QCD, some truly exotic combinations, for example molecule-like tetra-quarks or even penta-quarks, are also possible. Hints for such a penta-quark have been recently found at LHC. Understanding the combination rules for quarks has always been a big challenge for theoretical and experimental particles physics, because an extraordinary phenomenon is hindering scientific exploration of the processes that combine quarks together: the force between two quarks increases as the quarks move away from each other, contrary to all other fundamental forces of nature, that always fall off with distance. The QCD equations that describe the strong force mathematically represent one of the biggest challenges in theoretical physics. They can only be solved by sophisticated computer simulations, which require enormous amounts of computing time. Because of that, not all possible particle combinations have been explored so far. In its most recent publication, the COMPASS collaboration announces the existence of an extraordinary meson, which is made out of light quarks and has mass of 1.42 GeV/c2. 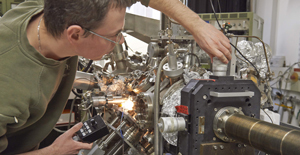 As numerous investigations have explored this mass range in the last 50 years, the discovery of the new particle at the COMPASS spectrometre at the Proton Synchrotron (SPS) at CERN is indeed a big surprise. It was only possible thanks to the largest worldwide dataset currently available for such investigations. 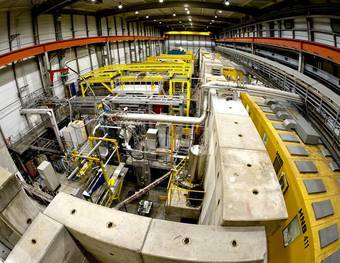 The new particle called a1(1420) was found during data analyses of experiments, in which pions were shot at a liquid hydrogen target with an impulse of 190 GeV/c. As this new particle is about 1,000 times rarer than the known mesons, a new, much more complex method of analysis had to be developed, led by scientists from the Physics Department of TUM. Various theoretical explanations for the new particle where proposed, some of which interpret a1(1420) as a molecule composed of known mesons (also known as a tetra-quark-state). Other explanations are based on postulating different long range effects of the strong force, but they fail to fully explain the experimental findings. 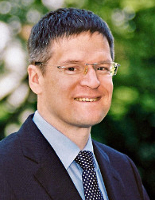 “This new particle a1(1420) is obviously a new member of the club of unexplained states”, says Prof. Stephan Paul of the Physics Department at TUM. Now the QCD experts have to solve another difficult problem. The COMPASS experiment has been running since 2002 at the Super Proton Synchrotron (SPS), the second largest accelerator at CERN. The collaboration includes about 220 physicists from 13 countries. 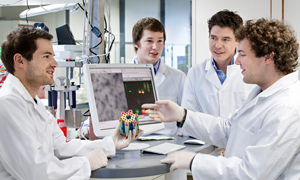 In Germany, the universities in Bochum, Bonn, Erlangen-Nürnberg, Freiburg and Mainz are involved, as well as the Helmholtz Centre Bonn and the Technische Universität München (TUM). In Germany, the research was supported by the German Ministry for Education and Research (BMBF), the Excellence Cluster Universe and the computing cluster C2PAP of the Excellence Cluster Universe, the Institute for Advanced Study of the TUM and the Humboldt foundation.